​There are two option are available for interested persons wishing to support turtle nesting monitoring in Belize. Adopt All Beaches - enable members of the Turtle Network to monitor all beaches in Belize. The last time this was undertaken was in the early 1990s and is sorely needed to understand changes in number of turtles nesting in Belize. Making a donation to the Adopt A Beach program is not required to participate. Sea turtles nest on sandy beaches throughout Belize from Ambergris Caye in the north all the way to the Sapodilla Cayes in southern Belize. 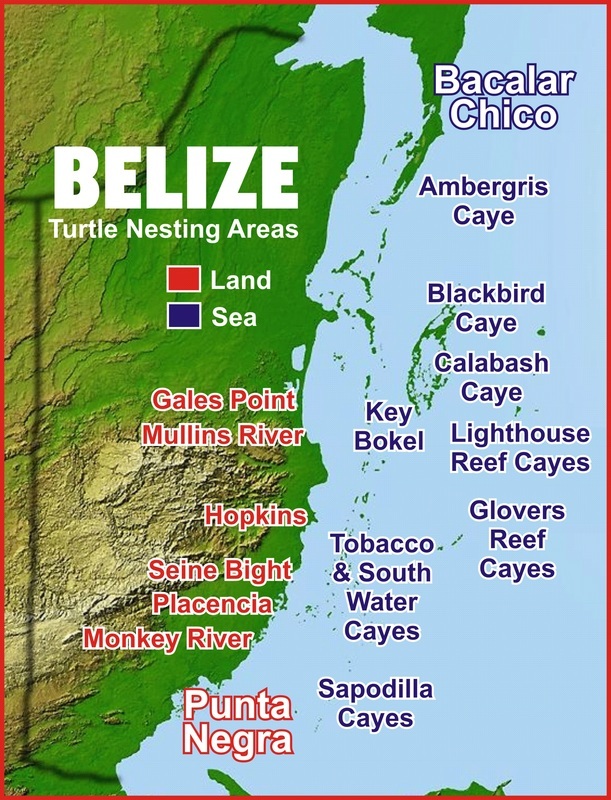 Mainland Belize from the Sibun River to Mullins River supports an important nesting colony of the endangered hawksbill sea turtle. The sandy beach from Monkey River to Punta Negra is likely important for nesting turtles but the level of nesting which occurs is unknown. ​Available to volunteers, schools, community organizations, and others who would like to participate in the program but are not in a position to make a contribution. ​Ideal for private coastal homes located on important nesting beaches. Sign up and you'll be kept abreast of activities and you'll receive recognition for your support! ​Sign up your resort and showcase your commitment to sea turtle conservation. You'll receive a laminated certificate that can be proudly be displayed in your lobby and receive laminated Nesting Beach and In-water Sea Turtle Fact Sheets for each guest room so their guests may learn and participate in the program. ​Many miles of important sea turtle nesting beaches are found along isolated sections of the mainland coast of Belize. The isolated beaches support endangered hawkbill sea turtles. Important beaches includes those at Gales Point, Mullins River, Hopkins, Seine Bight, Northern Placencia Peninsula, Monkey River and Punta Negra. Select which beach you would like to adopt or let us decide which nesting beach should benefit. Your donation will send a team of biologist to the beach to monitor nesting activity and nest success. ​Members of the Belize Sea Turtle Conservation Network met in 2011 and outlined key activities that were needed to assess the nesting populations of sea turtles in Belize. One activity included coordinated nationwide monitoring of all sandy beaches in Belize. The last survey of this type was completed 25 years ago. A nationwide survey is urgently needed so we can determine changes in nesting beach populations. Your contribution to this important activity will enable members of the Turtle Network to conduct one nationwide survey of all sandy beaches which will provide valuable data. The resulting data will be used to identify important nesting areas for sea turtles and to ensure their protection in the future. Thank you for supporting our efforts of promoting sea turtle conservation in Belize. Membership dues are listed in US currency. ​Payments can be made in the form of check payments or via our Credit Card Authorization form. Your membership package will be mailed to you by Belize Postal Service. Shipments to Belize are delivered within a week, to the USA in about 10 days, and other areas 2 - 3 weeks. ​Please consider sponsoring a school in your community to become a member!